The National Archives (NARA) contains a wealth of information about individuals whose names appear in census records, military service and pension files, ship passenger arrival lists, land records, and many other types of documents of interest to both beginning and experienced genealogists. Keep in mind that the NARA has artifacts of your ancestor’s interactions with the U.S. Federal Government. The Federal Government has almost no jurisdiction over state, local, or municipal activities, or over private enterprises, unless mandated by the Constitution. Therefore, they do not have birth, marriage, divorce, death, or similar state and local level records. 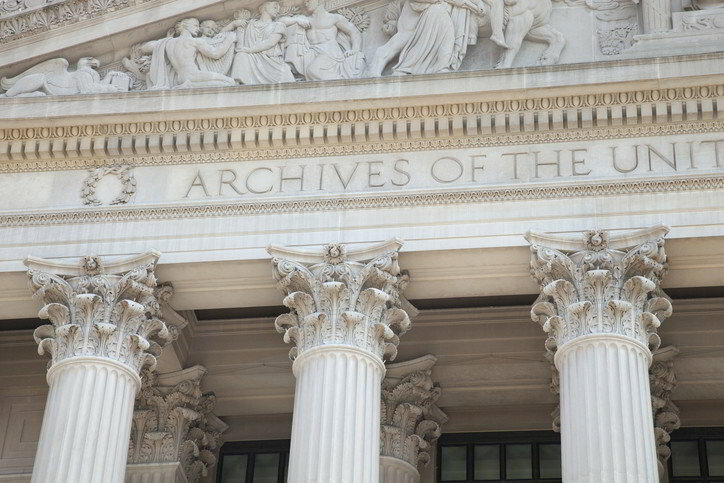 The National Archives is by no means a one stop shop for all your genealogy record needs. NARA is a great place to research census, ship passenger arrival, court, military service and pension records. Land records are of particular interest to genealogists and are available in the form of land entry case files. These records document the transfer of public lands from the U.S. Government to private ownership. Depending upon the type and time period, land case entry files can contain a wealth of useful information. These records were important to the Federal Government since they helped maintain control of various aspects of governance including congressional representation, immigration, taxation, legal, military, etc. From a practical standpoint, the main problem with accessing records at NARA is that there is no comprehensive index to its available resources. What this means to you is that you don’t have the luxury of just querying an index to see if records pertaining to your ancestors exist. Instead, you have to make blind queries for records that you suspect may exist. It is a bit like fishing. You may have to cast your line numerous times before you get a bite. For example, when I was looking for my ancestor’s ship passenger arrival record I did not know what port he entered. I had to systematically try each major port until I found the right one. You don’t necessarily have to visit one of the National Archives locations to get access to its collection. Digital or paper copies of specific records can be ordered by filling out a form at http://www.archives.gov/contact/inquire-form.html and paying a fee for the service. The catch here is that enough information about your ancestor must be known in order to fill out the form properly. Otherwise, you risk your form being rejected by NARA staff. For example, to order a copy of a census record, you must provide the name of the individual listed, page number, census year, state, county, township and enumeration district. In practice, I have found that you can get away with leaving some items blank, but they do need enough information to clearly identify when they have found the right record. Another approach is to hire a genealogist to do the research for you. The best way to go about this is to consult the National Archives website at http://www.archives.gov/research/hire-help/. Researchers can be located by research topic specialty, media type specialty or facility location. If you do need to make a visit to the Archives, there are very specific rules that need to be followed including signing the Researcher Application, getting a Researcher Card and being aware of all the rules for proper handling of records. For completeness, refer to the National Archives website at http://www.archives.gov/research/start/plan-visit.html, if you are serious about an onsite visit.